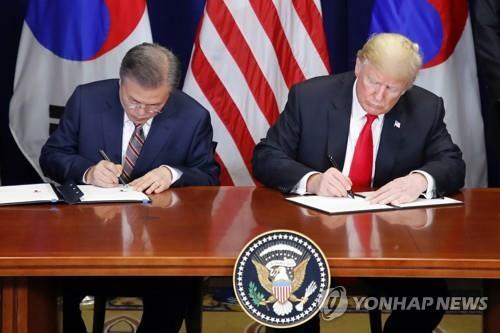 SEOUL, Oct. 12 (Yonhap) — South Korea’s trade ministry said Friday it has submitted a bill on ratifying the revised free trade agreement with the United States to parliament, the final domestic procedure needed for its implementation. The Ministry of Trade, Industry and Energy said it asked for the National Assembly to approve the amended trade pact, which was formally signed by two nations’ leaders in New York last month. The Seoul government hopes to complete domestic procedures by the end of the year, but the schedule may vary depending on whether Washington exempts South Korean autos from the list of 25 percent duties, proposed by the Donald Trump administration on national security grounds. South Korean lawmakers have pointed out that any tariffs on Korean vehicles under Section 232 of the Trade Expansion Act would hamper the ratification process of the revised trade deal. The agreement calls for Seoul to double the 25,000-vehicle unit threshold for U.S. car imports that do not have to comply with domestic industry regulations, which would enable 50,000 vehicles to enter South Korea more easily. Seoul also will apply eased vehicle emission standards for cars shipped from 2021-25 when setting new import regulations. American manufacturers complained that the environmental regulations act as a non-tariff barrier for their cars. In addition, the two sides agreed to make minor edits to the investor-state dispute settlement clause and to improve the transparency of anti-dumping and countervailing duty proceedings.